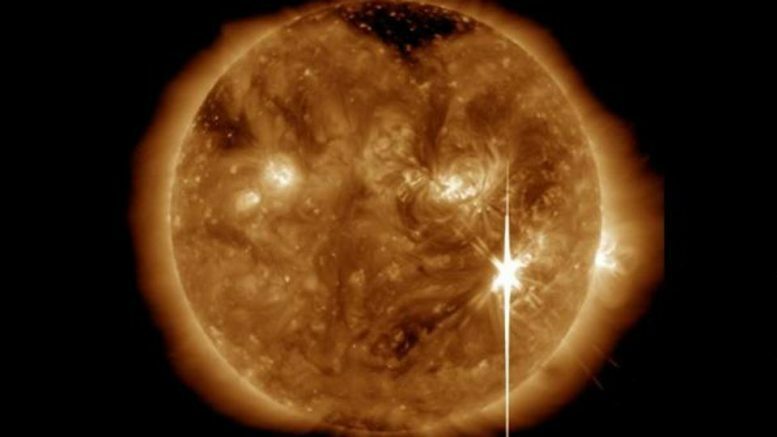 Two high-intensity solar flares were emitted on Wednesday, the second of which was the most intense recorded since the start of this sun cycle in December 2008, NASA said. These radiation flares, which can disrupt communications satellites, GPS and power grids by reaching the upper Earth atmosphere, detected and captured by the US Space Agency’s Solar Dynamics Observatory. According to the Space Weather Prediction Center (SWPC), these so-called category X eruptions disrupted high-frequency radio communications for one hour on the Earth’s side facing the sun and low-frequency communications used in navigation. Solar storms result from an accumulation of magnetic energy in some places. These jets of ionized matter projected — at high speed into and beyond the crown of the sun — hundreds of thousands of kilometers outward. Be the first to comment on "NASA captures images of strong solar flares"